Setting up new or editing existing ad campaigns is a common task for AvantLink merchants. 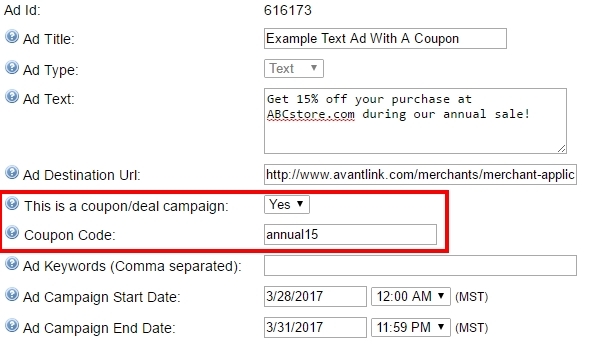 When making these adjustments, program managers will see a checkbox option in the ad configuration screen that indicates “this is a coupon/deal campaign”. When a program manager is configuring an ad that represents a sale, coupon or event that saves the end user money, this option should be used. Selecting this box will indicate whether an ad is a deal-oriented ad or not and triggers two additional and valuable functions. The Coupon/Deal Campaign configuration option on new ads followed by the coupon code box. Notice how the whole text ad is clickable, including the added coupon code portion at the end. The ‘Coupon Code’ field is purely optional, so if there is no code, no problem. That said, affiliates can search for ads based on being deal-oriented or containing coupon codes. 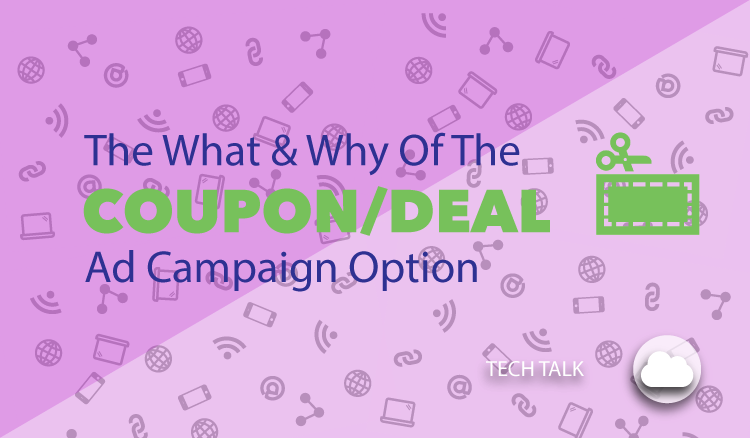 If your new campaign is representative of a sale, be sure to select the ad as deal-oriented. Affiliates can search for new ads based on if they are deal-oriented or if they contain coupon codes. Finally, the coupon code field will not be appended as written text to image-based ads. If you have an image ad that has been marked as a ‘Coupon/Deal Campaign’ and there is indeed a coupon code associated with it, it’s assumed that the coupon code is included in the image collateral. One of the most powerful tools AvantLink offers affiliates is the Dynamic Deal Feed. This RSS-like tool automatically detects and displays new deal-oriented ads from merchants that the affiliate chooses. When one of those merchants creates a new ‘Coupon/Deal Campaign’ ad, it will be pushed out to the affiliate’s website. This is all accomplished without any work needed from the affiliate. Learn more about the dyanmic deal feed in the video below.